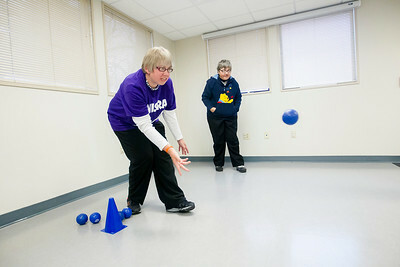 Sarah Nader- snader@shawmedia.com Gina Lofgren (left), 32, of McHenry throws a bocce ball while Eve Erita of Crystal Lake waits her turn during bocce practice at the Northern Illinois Special Recreation Association in Crystal Lake Thursday, March 24, 2016. NISRA has been providing recreational opportunities to the disabled for 40 years. 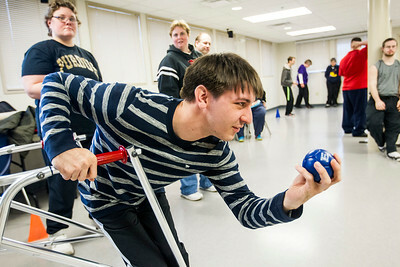 Sarah Nader- snader@shawmedia.com Joey Cook of Barrington throws a bocce ball during bocce practice at the Northern Illinois Special Recreation Association in Crystal Lake Thursday, March 24, 2016. NISRA has been providing recreational opportunities to the disabled for 40 years. Sarah Nader- snader@shawmedia.com Gina Lofgren (left), 32, of McHenry throws a bocce ball during bocce practice at the Northern Illinois Special Recreation Association in Crystal Lake Thursday, March 24, 2016. NISRA has been providing recreational opportunities to the disabled for 40 years. Sarah Nader- snader@shawmedia.com Ryan Smith (left) of McHenry celebrates a good throw while Gina Lofgren of McHenry and Eve Erita of Crystal Lake watch during bocce practice at the Northern Illinois Special Recreation Association in Crystal Lake Thursday, March 24, 2016. NISRA has been providing recreational opportunities to the disabled for 40 years. Sarah Nader- snader@shawmedia.com Eve Erita (left) of Crystal Lake, Gina Lofgren of McHenry and Ryan Smith of McHenry stretch before bocce practice at the Northern Illinois Special Recreation Association in Crystal Lake Thursday, March 24, 2016. NISRA has been providing recreational opportunities to the disabled for 40 years. Eve Erita (left) of Crystal Lake, Gina Lofgren of McHenry and Ryan Smith of McHenry stretch before bocce practice at the Northern Illinois Special Recreation Association in Crystal Lake Thursday, March 24, 2016. 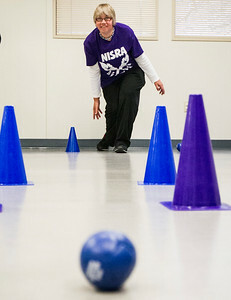 NISRA has been providing recreational opportunities to the disabled for 40 years.